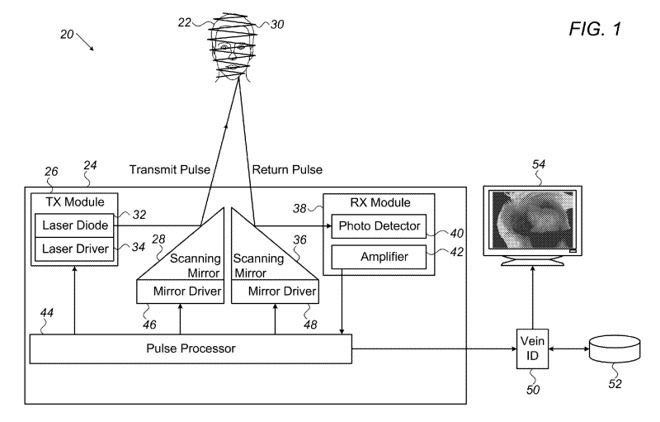 The U.S. Patent and Trademark Office published a patent on Tuesday called "Vein imaging using detection of pulsed radiation," granted to Apple. First applied for on November 12, 2015, the patent describes the use of an infrared emitter and a receiver that can detect blood vessel patterns below the surface of the skin. The system consists of an optical transmitter that emits multiple pulses of infrared light towards an area of the user's body, such as a hand or a face. The infrared light can pass through the skin and reflect off the user's veins, with returning light received by an image capturing device capable of accepting IR light. The data generated by the reflected IR light is then processed to generate an image of the blood vessels within the defined area. Based on the time-of-flight of the pulses, this technique could also be used to generate a three-dimensional map of the body surface. In the patent, Apple notes existing vein-based authentication systems for hands are considered to be very accurate "due to the complexity of the vein patterns in the hand." As said vein patterns are internal to the body, it would be extremely difficult for someone to produce a usable counterfeit, especially when used alongside other biometric systems. As vein imaging is also contactless, it also "alleviates hygienic concerns" associated with other systems that use fingerprints or handprints. While Apple does discuss vein authentication in relation to hands, the patent also indicates the possibility of using it in other areas. Supplied prior art images include photographs of a person's face, while a diagram of the system shows it being used on an illustration of a face. Vein-based authentication would potentially help Face ID from solving its "twin problem" if the two systems were used together. 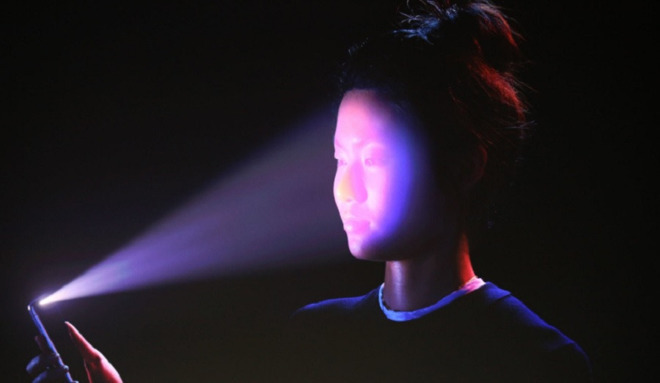 Face ID's facial map creation is thought to have a one-in-a-million false positive rate, with Apple itself suggesting there could be issues with identical twins or family members that are visually similar to each other. As the structure of veins in the face differ from person to person, even between twins, such a system would help minimize these false positive instances further. A requirement to read veins in a face would also make attempts to fool Face ID with a mask close to impossible, due to the need to replicate the target user's blood vessels. The inventors of the patent are listed as Andrew T, Herrington, Jawad Nawasra, and Scott T. Smith. Apple regularly applies for patents, filing ideas with the USPTO tens or hundreds of times a week, and in many cases the firm does not attempt to commercialize the described idea. As a result, there is no guarantee aspects of applied or granted patents will make an appearance in future Apple products or services. Due to the emitter and receiver system used in the TrueDepth camera array in the iPhone X, the addition of two more sensors or the repurposing of existing components to implement vein-based authentication does seem to be a plausible addition to a future Apple product.